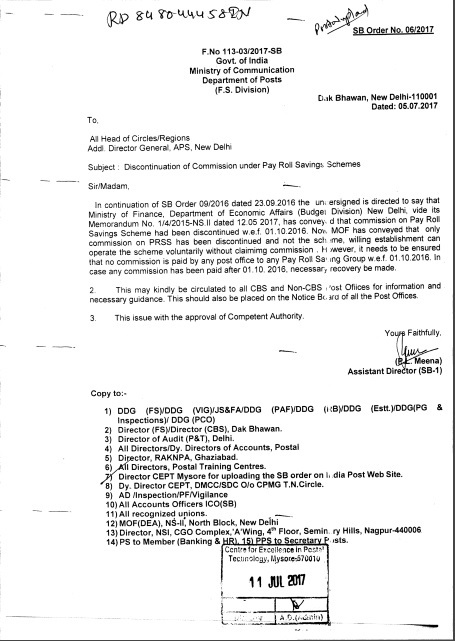 Subject : Discontinuation of Commission under Pay Roll Savings Schemes. In continuation of SB Order 09/2016 dated 23.09.2016 the undersigned is directed to say that Ministry of Finance, Department of Economic Affairs (Budget Division) New Delhi, vide its Memorandum No. 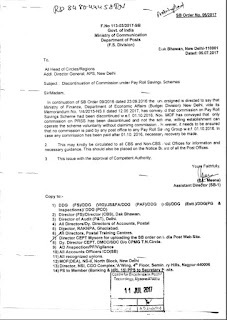 1/4/2015-NS.ll dated 12.05 2017, has conveyed that commission on Pay Roll Savings Scheme had been discontinued w.e.f. 01.10.2016. Now MOF has conveyed that only commission on PRSS has been discontinued and not the scheme, willing establishment can operate the scheme voluntarily without claiming commission. However, it needs to be ensured that no commission is paid by any post office to any Pay Roll Saung Group w.e.f. 01.10.2016. Case any commission has been paid after 01.10. 2016, necessary recovery be made. 2. This may kindly be circulated to all CBS and Non-CBS Host Offices for information and necessary guidance. This should also be placed on the Notice Board of all the Post Offices.